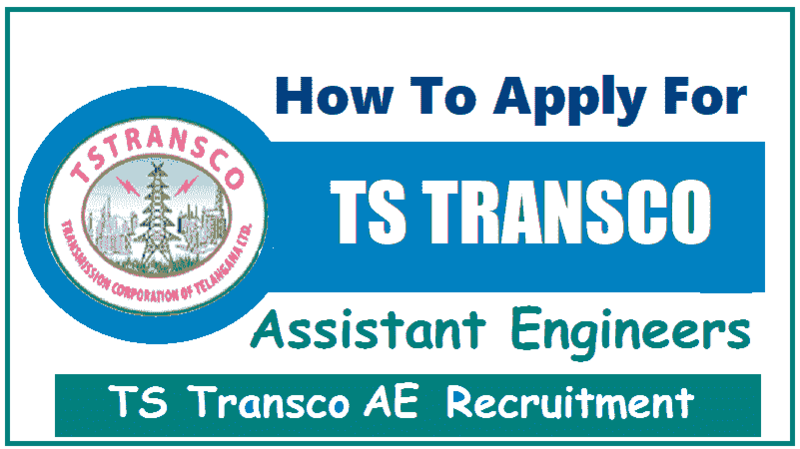 How to apply for TS Transo AE Assistant Engineers Recruitment 2018 (AE Civil, Electrical, Telecom Posts), TS Transo AE Assistant Engineers Online application form @ www.tstransco.cgg.gov.in, Step by step online application from submission process for AE Posts in TS TRANSCO. Transmission Corporation of Telangana Limited, Vidyut Soudha has given Assistant Engineers Recruitment 2018 notification and applications are invited On-line from qualified candidates through the proforma Application to be made available on http://tstransco.cgg.gov.in to the post of Assistant Engineer (Electrical), Assistant Engineer (Civil ) & Assistant Engineer (Telecom). Candidate has to visit the website http://tstransco.cgg.gov.in to view the detailed notification and User Guide. The fee mentioned at Para- I (5)(a) is to be paid online by visiting the link MAKE PAYMENT in the website duly following online instructions. acknowledgement in the form of a downloadable pdf document. The fee once remitted shall not be refunded or adjusted under any circumstances. Failure to pay the examination fee, application fee wherever applicable will entail the total rejection of application. detailed above and obtain Fee paid receipt with Journal Number (12 digit) in the first instance. http://tstransco.cgg.gov.in to view the detailed notification, User Guide and Application Form. Step 4. Then invariably fill all the relevant fields in the Application. Step 5. Immediately on submission of application, applicant will get an acknowledgement in the form of a downloadable pdf document. instructions and User guide on their own interest before submitting the application. be very careful in Uploading / Submitting the Application Form On-line. though he/she comes to the final stage of recruitment process or even at a later stage. column of the Application Form should be left blank, otherwise application form will be rejected. last date to avoid last day rush. on to http://tstransco.cgg.gov.in and click on to complaint box. 1. Applicants must compulsorily fill up all relevant columns of application and submit the application through website only. The particulars made available in the website shall be processed through Computer and the eligibility decided in terms of notification. i) Paste the Photo on any white paper as per the above required dimensions. Sign in the Signature Space provided. Ensure that the signature is within the box. ii) Scan the above required size containing photograph and signature. Please do not scan the complete page. iii) The entire image (of size 3.5 cm by 6.0 cm) consisting of the photo along with the signature is required to be scanned and stored in *.jpg format on local machine. iv) Ensure that the size of the scanned image is not more than 50KB. v) If the size of the file is more than 50 KB, then adjust the settings of the scanner such as the dpi resolution, no. of colors etc., during the process of scanning. vi) The candidate has to sign in full in the box provided. Since the signature is proof of identity, it must be genuine and in full; initials are not sufficient. Signature in CAPITAL LETTERS is not permitted. vii) The signature must be signed only by the candidate and not by any other person. Hall Ticket, the candidate will be disqualified. browse button at the time of submission of application form. 4. The applicants should not furnish any particulars that are false, tampered, fabricated or suppress any material information while making an application through website. 5. All the essential certificates issued by the competent authority of Telangana State shall compulsorily be kept with the applicants to produce as and when required to do so. Failure to produce the required certificates on the day of verification will lead to disqualification. 1) Age: Proof of age as recorded in SSC certificate or equivalent. 2) Qualification of BE/B.Tech/AMIE or equivalent from any recognized University in India. 3) Permanent Community certificate in original obtained from Govt. of Telangana Statein respect of SC/ST & BC candidates clearly indicating the Sub-Caste and group. Further, candidates claiming to be belonging to B.C. have to produce a certificateregarding their exclusion from the Creamy Layer from the Competent Authority (Tahsildar). 4) PH Certificate (PH-VH, PH-HH & PH-OH) issued by the Government of Telangana - if PH status is claimed. 8. Candidates will be required to appear for written test as and when conducted at their own cost. 9. Admission for written test or calling the qualified candidates in the written test to furnish documentary proof does not confer any right for appointment. 10. The decision of the Selection Committee/TSTRANSCO is final in selection and allotment of candidates.